Why do you hate fat people? Not everyone can or should be skinny? Why do we have to even think about my future? I had so many questions. I had the usual, "will I die?" questions that most people facing Roux En Y Gastric Bypass have. He responded with other questions. "Don't you want to feel better in your own body?" The reality is that I did feel good, mostly. 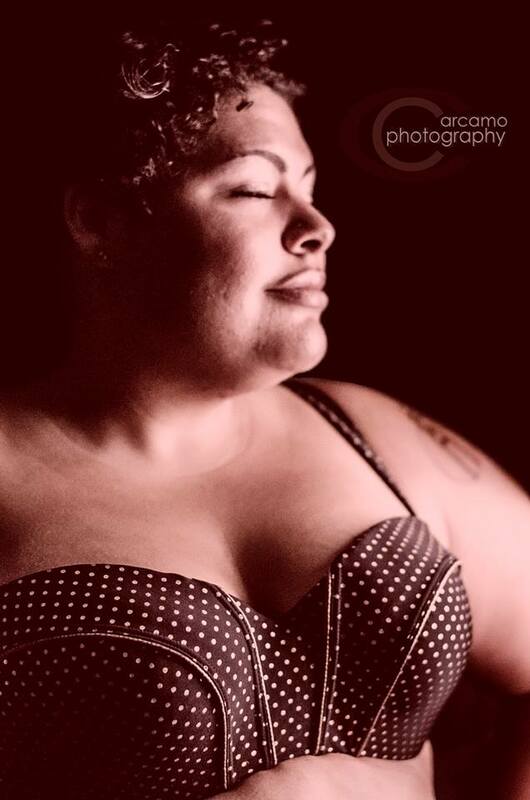 I was physically active, sexually confident, and felt safe in the larger body I had. I was 285 pounds and doing things people half my size couldn't do. I ran a marathon, joined roller derby, and got my Zumba certification. My body didn't hold me back, and that might be because a huge part of me putting on the layers of fat on my body was about protecting myself. My first memory of sexual abuse was when I was six. The abuse and assault continued until I was thirteen. Somewhere along the way, I began to believe that it was my fault. I was told how beautiful I was, how attractive I was, and how good my body looked during some of the abuse. My adolescent mind decided that I could control what was happening to me by packing on pounds. Each pound was a layer of protection. This irrational belief launched into years of disordered eating behaviors. I binged and purged. When purging was no longer an option I binged and yo-yo dieted. I'd decide to "get healthy", and lose weight. The shedding of weight and increase of attention would frighten and trigger me and I would binge, inevitably putting on more pounds than I lost before. Two years ago I decided I would get serious about dealing with my the deeply wounded parts of myself. I started working with a psychologist and a nutritionist to confront my eating behaviors and body image issues. Over the last two years, I learned to truly love myself. I felt empowered and strong. I began to see the 285 pounds I weighed as a continual reminder of the armor I no longer needed. More than that, I talked with my healthcare team and discovered some of what I already knew: my extra stomach fat was causing issues with my endocrine system. I was taking several medications to feel healthy and fight the effects of being morbidly obese. December 30th, 2013 I checked into the surgery center in the town over. My friend Camille sat with me and encouraged me that morning and took care of me until I was discharged. Before surgery I took some photos to honor and remember my body. So far I've lost 110 lbs. I kept my surgery private for a whole year because of this: I am still strongly triggered when people pay attention to my body. I need to feel in control of my own body and the messages about my body. I needed to not seek anyone's approval and walk this journey (mostly) alone. I also didn't need to be distracted arguing with people on THEIR thoughts about weight loss surgery. It was the right choice for me and people can't get really nasty and shaming about the procedure. I've had an awesome support system who have honored my journey and supported me. I used to believe that weight loss surgery was "cheating". I told my psychologist, "I want to earn it, I want to do it the right way... I don't want to cheat." As Dr. Clemons often does, she put her hand under her chin and sat for a moment thinking. She thoughtfully replied, "Jasmine, I wonder how many pounds you've gained and lost over the years." "And even if it were taking the easy way out... who wouldn't take the easy way out. Why is that bad?" Why is doing something to decrease our struggle "cheating"? I still don't have the answer for that. What I do know is that my success in weight loss and removing my layers of armor hasn't been the easy way out. It has been a deeply painful struggle and I've earned every loss. Tomorrow is the one year anniversary of the day I started to take of the armor I decided to put on to both punish and protect myself. I lost 110 pounds of body mass, but I also lost an unnameable amount of shame and suffering. I am still working with Dr. Clemons. I am still walking this journey that includes self kindness, self care, and honoring this body of mine. This is just one part of multifaceted story, and I hope now that you know more of it, you'll continue to join me on my journey.